Martin, Sister Gail Ann 7/10/1939 - 4/29/2018 Grand Rapids Martin, OP, Sister Gail Ann (formerly known as Sister Joseph Therese) of Grand Rapids (born in Detroit, MI) died on April 29, 2018. She was 78 years old and a Dominican Sister for 60 years. Sister Gail Ann received an MA in Religious Education from Aquinas College and an MA in Elementary Administration from Michigan State University. Sister Gail Ann taught and was often principal at the following schools: St. Mary, Carson City; St. John, Essexville; Sacred Heart, Muskegon Heights; St. Mary, Saginaw; St. Joseph, Bay City; Sacred Heart, Merrill; Our Lady of Perpetual Help, Chesaning; Marywood Academy; Muskegon Catholic Central and the Greater Muskegon Catholic Schools; and in New Mexico at San Miguel School, Socorro and St. Mary School, Belen. Sr. Gail Ann later entered service ministries in Detroit, including the Open-Door Ministry which provides meals, clothing, medical care, housing services and hope to those in need. She later served the St. Vincent de Paul Society as coordinator of Conference Social Services and then as administrator for the Greater Corktown Development Corporation, which provided housing for people with low income. In retirement Sister Gail Ann assisted at Marywood and Marywood Health Center in support services. Her interests included reading, visiting and travel. Listening, reflecting, expressing her hopes and dreams, growing, serving others Sister Gail Ann is at rest now, reaping the benefits of a life spent in the service of Love. Sister Gail Ann is survived by her sisters: Patricia Mullett, Livonia, MI; Sharon Lancia, Trenton, MI; Barbara Beauchamp, Livonia, MI and Mary Downs, Yaphank, NY; nieces, nephews, many friends, and members of her Dominican Sisters ~ Grand Rapids Community. Sister Gail Ann will repose at Dominican Chapel/Marywood, 2025 Fulton Street East, with visitation on Tuesday, May 1 from 6:00-7:00 pm, followed by a Remembering Service at 7:00 pm. A Funeral Mass will be celebrated at 4:00 pm on Wednesday, May 2 at Dominican Chapel/Marywood. Burial will be at Resurrection Cemetery. 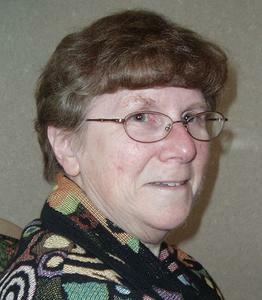 Memorials in Sister Gail Ann Martin's name may be made to the Grand Rapids Dominican Sisters Health Care Fund.